Below are the complete details of the Painter jobs in Mohmand Group Trade Test And Technical Training Center in Swabi. Skills Required for Job: Candidates must have Good Communication Skills. Good Team Working Skills. Preparing painting surfaces by washing walls, repairing holes, or removing old paint. Mixing, matching, and applying paints and other finishes to various surfaces. Providing decorative and faux finishes as the project requires. Handling planning and prep work in an efficient manner. Qualification: Painter Jobs In Saudi Arabia. Attractive Salary Package. Test/ Interview Date will be 12th January 2019. 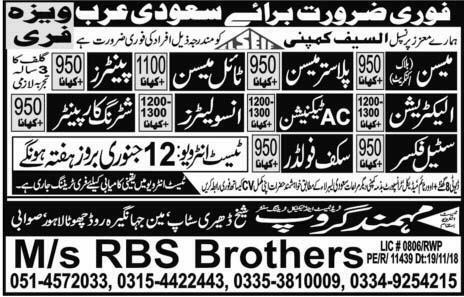 Painter jobs in Mohmand Group Trade Test And Technical Training Center Swabi, in Pakistan published on Paperpk.com from newspaper on January 08,2019. Job seekers who are already working as Painter , Building Painter , Asst Painter , can also apply for post of Painter.